Minnesota and Northern California: Political Twins or Political Opposites? Two U.S. states that largely bucked the Republican trend in the 2014 election were Minnesota and California, which count among the “bluest” states in the union. Since 1976, only Minnesota has supported the Democratic candidate in every presidential election. California has more recently entered the Democratic fold, having voted for a Republican presidential candidate as recently as 1988, but in recent years it has been a reliably blue state. In the 2014 election, California gave a higher percentage of its vote (59) to the Democratic gubernatorial candidate than any other state. In Minnesota, by contrast, the winning Democrat received only 50 percent of the vote, as opposed to the 44.5 percent received by his Republican opponent. Minnesota also elected a primarily Republican delegation to its state House of Representatives (72 Republicans to 62 Democrats) in 2014, whereas the incoming lower house of California’s state legislature has a 52 to 28 Democratic edge. California thus currently stands as the “bluer” or these two blue states, a standing also reflected in the 2012 Presidential election, in which Barack Obama took 60 percent of California’s vote as opposed to 53 percent of Minnesota’s. 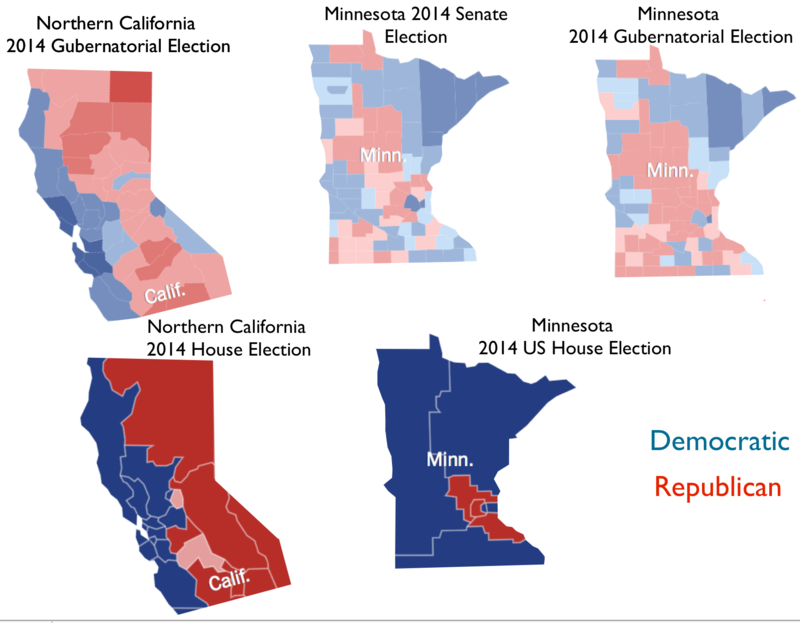 But if California and Minnesota are both Democratic bastions, their actual patterns of electoral geography are quite distinctive. 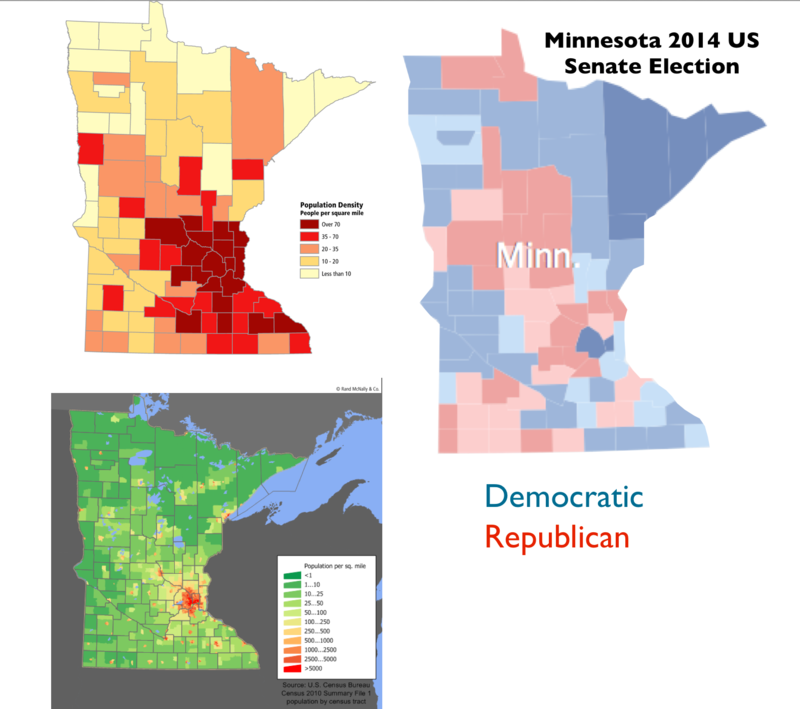 To illustrate these differences, I have prepared several maps contrasting the 2014 election results in Minnesota with those in northern California. I have focused on northern California rather than the state as a whole for three reasons. First, northern California (as I have defined it here) and Minnesota are of roughly equal size, making cartographic comparison relatively simple. 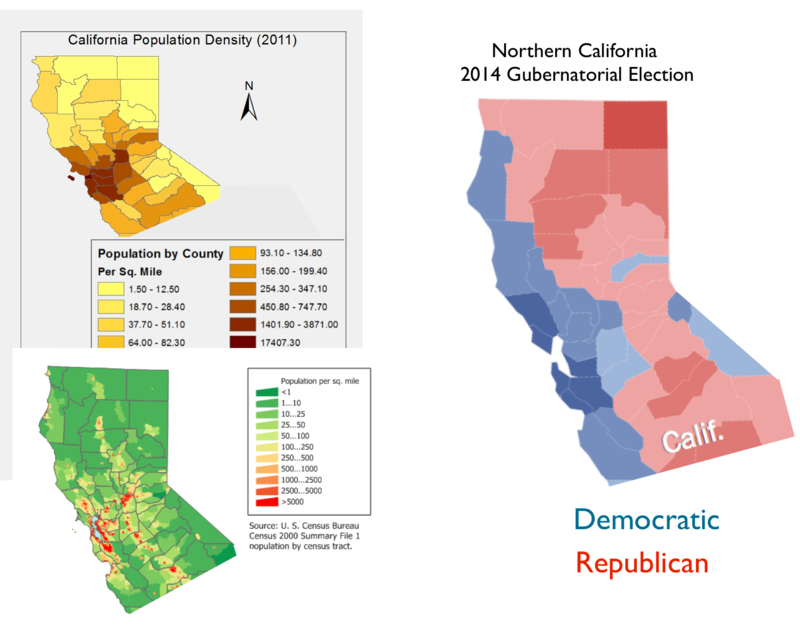 Second, several southern Californian counties are so large, in both area and population, that they undermine simple comparisons using county-level maps. Third, the geographical contrast with Minnesota that I want to emphasize is more pronounced in regard to northern California than to southern California. The major difference in voting behavior between Minnesota and northern California centers on population density and proximity to major metropolitan areas. In both places, counties containing large cities strongly supported candidates from the Democratic Party. That, however, is where the similarity ends. In northern California, the suburban counties that ring San Francisco Bay also voted for democratic candidates, and many of them did so quite heavily. Northern California’s inner suburbs tend to be deep blue, while the outer suburbs and exurban fringe are at least light blue. 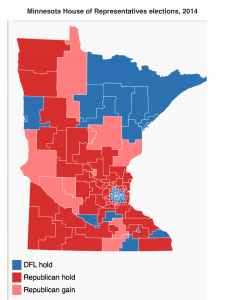 Contrastingly, in Minnesota the outer suburban belt that surrounds the Twin Cities of Minneapolis and St. Paul tends to vote for Republican candidates, often quite strongly. Indeed, one of the most conservative members of Congress, Michelle Bachmann, represents the northern suburbs of “the cities.” Bachmann did not run in 2014, but her Republican successor easily coasted to victory. The contrast between the Minnesota and northern California also extends to rural counties. 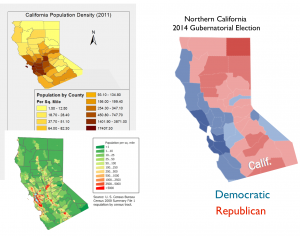 In northern California, largely rural counties tend to vote for Republican candidates. The main exception is the north coast, where lightly populated Mendocino and Humboldt counties are noted for their strong counter-cultural elements (they form the bulk of the so-called Emerald Triangle of widespread Cannabis cultivation). 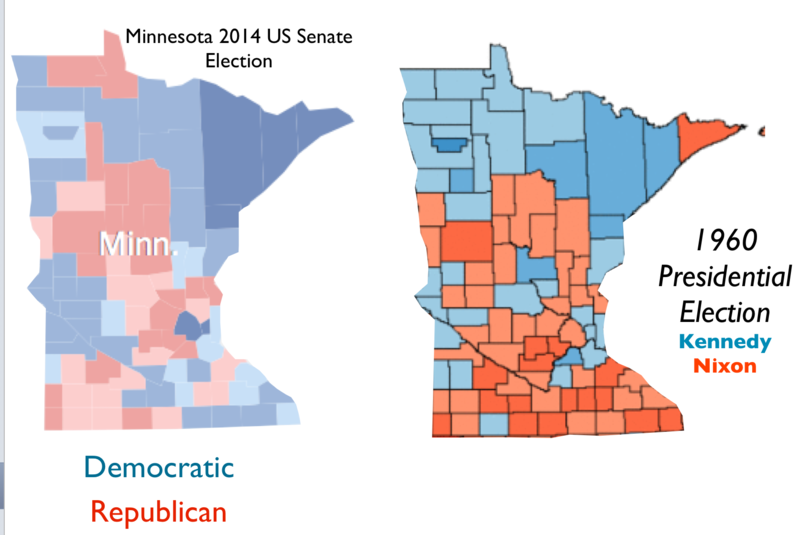 In contrast, many rural Minnesota counties still generally vote for Democrats, as is clearly evident on the map of the 2014 U.S. Senate election. This pattern holds both for agricultural counties in the west and south and for the mining/logging region of the northeast (which also includes the minor industrial/port city of Duluth). On the map of U.S. House of Representative delegations, California thus exhibits something of a classical “core/periphery” pattern (with a blue “core” and a red periphery), whereas in Minnesota one finds instead a core/semi-periphery/periphery pattern (with blue yielding to red and then to blue again as one leaves the metropolitan center). Minnesota’s electoral pattern is the older of the two. Consider, for example, the 1960 presidential election, in which the Democrat, Jack Kennedy, narrowly beat the Republican, Richard Nixon. In the 1960 presidential contest in California, Kennedy won San Francisco as well as the (at the time) industrial East Bay counties of Alameda and Contra Costa, yet lost the suburban West Bay counties (Marin, San Mateo). Kennedy also took a majority of northern California’s rural counties, especially those in the sparsely populated far north. 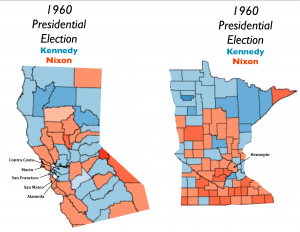 But by the end of the 20th century, northern California’s electoral geography had shifted, with the rural counties trending strongly Republican and the suburban counties trending clearly Democratic. 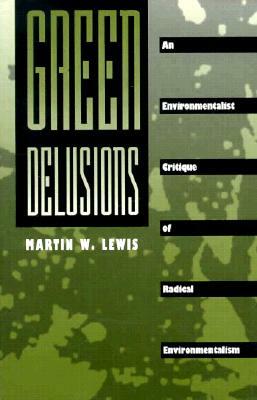 The same transformation occurred in the northeastern U.S. states. In the south and much of the Midwest, however, suburban countries have stayed Republican, while White-majority rural areas have either remained or switched into the Republican camp. Minnesota is unusual in that many of its White-dominated rural counties continue to vote for Democrats. 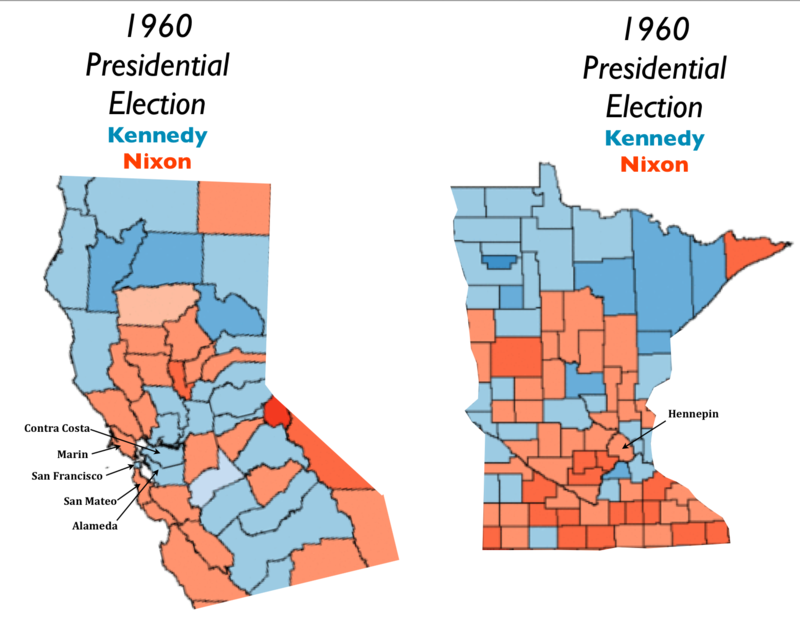 The 1960 presidential and the 2014 gubernatorial maps of Minnesota show remarkably similar patterns. One difference between them is a shift to more Democratic voting in the mostly rural southeastern corner of the state. Hennepin County, which contains Minneapolis, has also, much less surprisingly, moved in the same direction. 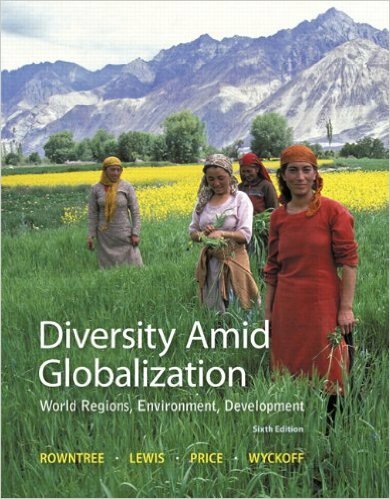 Contrastingly, Republican voting has intensified in the countries that encircle the Twin Cities. Minnesota’s distinctive voting behavior might be linked in part to its distinctive left-leaning political party: its state-level affiliate of the United States Democratic Party is actually the Minnesota Democratic–Farmer–Labor Party (DFL), which was created in 1944 by a merger of the populist, democratic-socialist Farmer-Labor Party with the Democratic Party. This legacy may be responsible for some of the DFL’s continuing clout in rural areas. 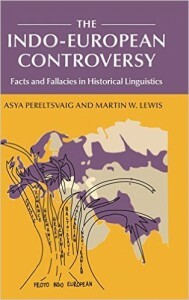 Additional factors, however, are no doubt also in play. Across the United States, White-dominated rural counties have been gradually moving into the Republican category. 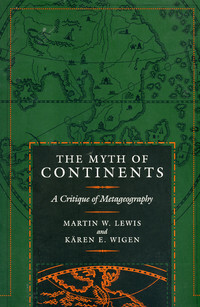 This process has played out at different times in different places. Much of Appalachia has only recently made this transition, which has turned West Virginia from a solidly blue to a solidly red state over the past 20 years. The one part of the country in which many White-dominated rural counties still tend to support Democrats is the Upper Mississippi region, anchored by Minnesota but also including parts of Iowa, Wisconsin, and Illinois. Will these areas as well turn red in coming elections? Even in Minnesota, the Republican Party is gaining ground in such places, as can be seen in the map of Minnesota’s State House of Representatives 2014 election. And in the 2014 senatorial election in neighboring Iowa, this pattern was much more pronounced, as will be examined in the next GeoCurrents post.